This is the Kennicott Glacier, just outside McCarthy, which is located in the Wrangel St. Elias Mountain region in southeast Alaska. It can be reached easily by aircraft or by driving over 60 miles of unpaved, rough road. 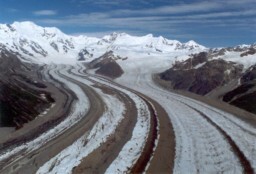 This photo was taken as we took off from the airport in McCarthy, and it shows the natural striations of the glacier. 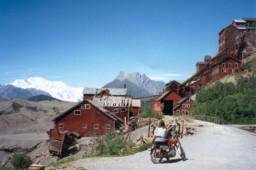 The abandoned Kennicott mine was the largest copper mine in the world and is still the largest wooden structure in existence. We may have been some of the last people to visit it in its natural state, with nothing more than small signs warning us to stay out of the buildings. While we were there it was purchased by the National Park Service. In the background is Mount Blackburn, 16,000 feet above sea level and only 4000 feet lower than the much more famous Mount McKinley. Linda relaxing under the wing at our airport campsite. The mounds of dirt in the background are actually part of the glacier. 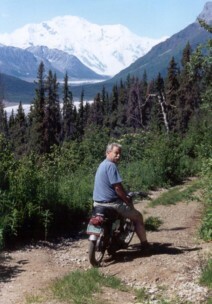 The towns of Kennicott and McCarthy (each of which consists of only about a dozen buildings) are only a few miles apart, and the motorcycle made travelling between them simple. We were struck by how everyone driving by waved at us, until we found out that they all thought we lived there, since the only time vehicles travel into either town is in the winter, when the Kennicott River is frozen over. 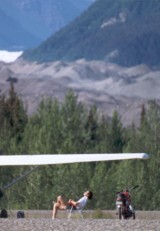 As far as we know, we were the first motorcycle to have actually flown into town. We used the Ducati to travel off the beaten path when we could. Here we have been riding along one of the old mining access roads, with Mount Blacburn again in the background. 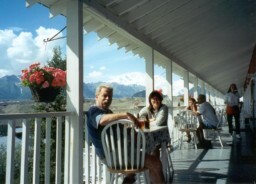 Enjoying a drink in the afternoon at the Kennicott Lodge, we later returned that evening for dinner. The governor of Alaska and a number of other dignitaries were all there that night as part of the transition of the mine to the National Park Service. 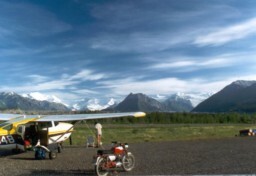 Camping next to the runway at McCarthy. The runway is in the background. Most of the runways on this trip were dirt, grass, or just plain rocks.